Olkhon Island is one of Siberia’s hidden gems. It’s located in the middle of Lake Baikal, the world’s deepest lake. It’s a fairly common summertime destination for Russian tourists, but few foreign tourists visit it. I recommend it as a stop along the Trans-Siberian Railway. This Olkhon Island travel guide will go over everything you’ll need to know before visiting Olkhon Island. Olkhon Island is about 250 kilometres north-east of Irkutsk. It takes 6-7 hours by bus/marshrutka, with a 15-minute ferry ride along the way. The ferry runs from May to December, and outside of those times, the island can only be reached when the lake has frozen over (date varies). I arranged my roundtrip transportation with my hostel in Irkutsk (any hostel there will be able to do this). My hostel charged 1800 RUB ($27) round-trip in a shared minivan. If you wish to take a bus, there are four buses departing daily from Irkutsk’s central bus station. The main village on Olkhon Island is called Khuzir, and that is where your transport from Irkutsk will drop you. There are a couple of very nice homesteads in Khuzir that offer full room and board, and offer day trips to other parts of the island. Rural Hostel: If you book your transportation with the Baikaler hostel, they’ll recommend this place. I stayed here and really enjoyed it. Olga cooked great food, and the rooms were comfortable and clean. For my two night/three day stay, I paid 2600 RUB ($39). This price included two dinners and two breakfasts. Nikita’s Homestead: The most popular homestead on the island, offers a variety of different room types and has a great location. It does get sold out, so try to book ahead. Camping: There’s a number of campgrounds on the island, so if you have a tent with you these could be a good option. The island is massive, so if you want to explore a bit there are a ton of places to wild camp. Olkhon Island has a ton of different things to do. In Khuzir, you can visit the beach, along with the incredible Shaman Rock (make sure to see it at sunset!). For excursions outside of Khuzir, I’d recommend booking with your guesthouse. I found them to be reasonably priced, and you’ll get your transport and lunch covered. There isn’t any public transportation around the island, so unless you have your own vehicle this is the only way. There are a few places that can also be accessed via bicycles that can be rented from your accommodation. Cape Khoboy: This is a must-do activity when visiting Olkhon Island. 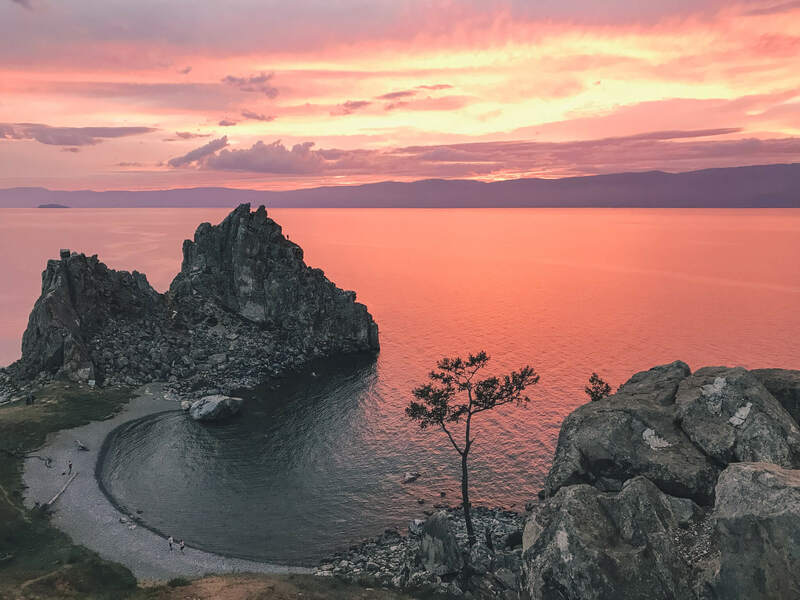 Cape Khoboy is the northernmost tip of the island and offers incredible views of Lake Baikal. My guesthouse offered tours to the cape for 1000 RUB ($15), which included all transport, entrance fees, and a lunch. Other excursions include fishing, boat tours, and camping trips. Almost all excursions can be booked the day before, so feel free to just show up and decide when you get here! Planning a trip on the Trans-Siberian Railway? Check out my comprehensive post on places you need to stop along the Trans-Siberian Railway! Feel free to contact me with any other questions you have about travelling to Olkhon Island! 20-year old Canadian dude who loves to visit off-the-beaten-path places, climb tall mountains, and try delicious foods.